Refugees in Clarkston Georgia are finding community, friendship and a shot at the American dream; all over a cup of coffee. You can feel the warmth in the question. It's a hospitable gesture with a universal meaning: You are welcome here. At a small coffee shop in Clarkston, Georgia, you hear that question asked in imperfect English and thick accents. The employees at Refuge Coffee know what it feels like to long for a welcoming word. So do many of their customers, who fled wars and violence around the world. "We don't treat them like a customer coming to buy a cup of coffee," said Ahmad Alzoukani, himself a refugee from Syria. "We just think 'oh this is my brother, this is my sister, this is my friend.'... So we became like a family." That connection has always been a key goal for Refuge Coffee founder Kitti Murray. She wanted to create a safe space for people to get to know their refugee neighbors. "We want to connect people. We want refugees to get to know Americans who live all around them. We want Americans who don't know a thing about refugees to get to know them," Murray said. "And we see it over and over again that real friendships are made over one cup of coffee." Kitti and her husband, Bill, moved to Clarkston in 2013 and found themselves in a small Georgia town unlike any other. Clarkston has served as a refugee resettlement location for a generation, and is now called "the most diverse square mile in America." To help create job opportunities for refugees, the Murrays refurbished a 1986 Chevy delivery truck and turned it into a mobile coffee van. They parked at an old gas station in the heart of the refugee population. Their initial plan was a coffee place operated by refugees for refugees. And then the rest of the town showed up. Clarkston rallied around Refuge Coffee and it has become a hot spot for both locals and refugees. The gas station was converted into a coffee house, a safe space decorated with artwork from around the world. As word spread, the Murrays outfitted a second mobile coffee truck for catering and service around the greater Atlanta area. 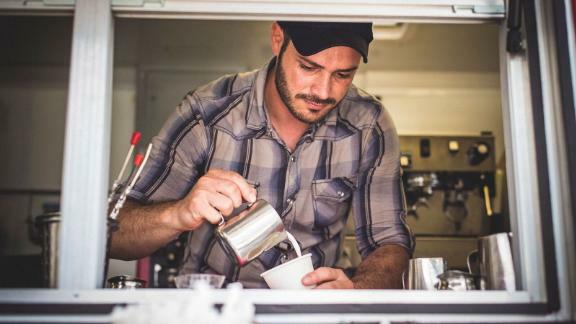 Refuge Coffee hopes to push its trucks out as far as it can. Every party, event and community the business can serve makes an impression. "What we get to do is tell the rest of the world a more beautiful and more accurate refugee story," Murray said. "You get to show people that refugees are benefits to the community, that they are not scary, dangerous people, that they offer a lot to our world." Refuge Coffee runs a one-year full-time training program for refugees. These living-wage jobs also come with English classes, a business mentorship program and entrepreneur training. "So it's not just like a job, it's like home," Alzoukani said. "It's like a mother who provides you help and care for a year to get you on your feet." Alzoukani returned a year after his training to become the catering manager. Now he works with the new employees to help them also achieve their American dreams. "Honestly, when I came to here I realized that I'm going to heaven," Alsoukani said. "I'm so grateful to this country and I'm still willing to work hard and try to create and make everything for me and for the others. The dreams are coming and they are become true, and it is going to be happening, I promise."